Head of Tesco Labs Angela Maurer said bad product layouts with gaps on shelves is a bad customer experience, with a lot of time and science going into planograms to work out which products sell better in what positions. “You take a picture, upload it to the cloud and in a few seconds you find out whether the product has been recognised and if it’s in the right location,” Maurer told delegates at the National Retail Federation conference in New York City. “To be able to get that information whenever we want without relying on colleagues to get it is incredibly powerful,” she added. “And once you’ve got that recognition, the opportunities to use that information are limitless." 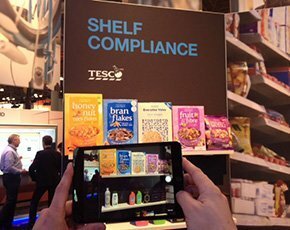 A consumer could potentially snap a photo of a shelf of products and have information on the products overlaid using augmented reality. “If you’re diabetic, to be able to look around the shelves and automatically get information on the sugar content – that’s incredibly powerful,” said Maurer. She also said while there are many other suppliers working on image recognition software, IBM was the one Tesco Lab felt could do the project at speed, while being flexible enough to deal with issues such as scrunched-up crisp packets and reflections. Tesco Labs is a relatively new division of the retailer which spends the majority of its time thinking about end-customer needs and the supporting technologies that could make the customer experience better. Tesco Labs is a 25-person team made up of researchers, designers, developers and product managers spread across the globe.